Saving for a first home can seem an insurmountable task. Whether you’re in Sydney, Brisbane or Adelaide, scraping enough together for a 20 per cent deposit can — and usually does — take years. So Australians hoping to buy their first home will be buoyed by a new report which has found the average time needed to save a deposit has fallen over the past 12 months in major capital cities. 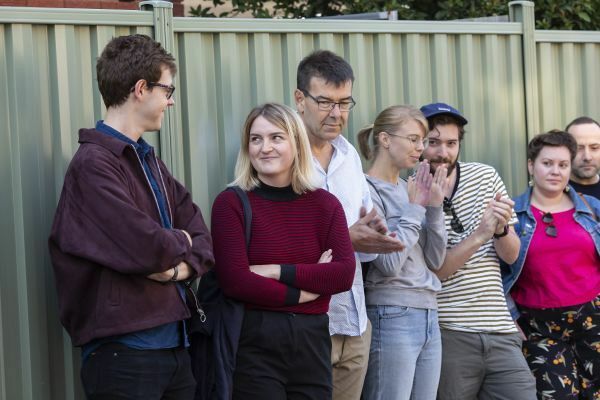 According to the Domain First-Home Buyers Report, released on Friday, a dual-income couple aged between 25 and 34, who were each saving one-fifth of their post-tax income, would now reach their dream of owning a house faster in Sydney, Melbourne, Perth and Darwin. For couples in Canberra, Brisbane and Adelaide, it now takes one month longer to save for a house deposit than it did this time last year. Certainly, getting that foot on the ladder is a tough task, wherever you are in Australia. Here’s how first-home buyers across all of our capital cities have managed to make the great Aussie dream their reality. Sydney couple Anthony Medina and Jenny Gao bought their first home in March after years of saving. Mr Medina decided to start saving for a deposit the moment he finished school and began working as an electrician, but he said it was hard at the outset to save much as an apprentice. “I’ve been a bit lazy … I always thought of doing [it] but never really pursued anything,” Mr Medina said. It was not until he met his partner Jenny two years ago that he seriously began saving and looking for property. “I ran it past her and she thought it was a good idea as well,” he said. Mr Medina said the combination of a few years of savings under his belt and the property downturn in the past year had created the perfect timing to get his foot in the door. “I was planning on doing it a couple of years ago but now that prices have dropped, it seemed like a perfect time,” he said. After saving $150,000 for their deposit, the young couple began looking in November in several areas, including Riverwood, St George and even Concord, where they are currently renting. They had a budget of $650,000 to $700,000 in the hope of avoiding paying stamp duty. In the end, they snapped up a two-bedroom unit in Kogarah for $658,000, paying just $1600 for stamp duty. Mr Medina said they ended up settling for a unit because they wanted to stay within their budget and not live too far out west. He said the past year of saving for a deposit was the hardest as they were paying $350 a week in rent. “It was a lot easier maybe prior to a year ago because I was living with my parents; I still had a bit of flexibility but now paying rent, it’s hard to save when you’re paying rent,” he said. They are a few weeks away from moving into their new home and are already thinking of ways of reducing the stress of their initial mortgage repayments, which will be about $2500 a month. Melbourne couple Sarah and Nicholas McLoughlin bought their first home last November. They snapped up a four-bedroom, two-bathroom home in Eltham through an expressions-of-interest sale for $855,000. The McLoughlins had been renting in Eltham for 18 months before buying to save money for a deposit. This allowed them to save more money than when Ms McLoughlin had been renting a separate apartment in South Yarra, while Mr McLoughlin had been sharehousing with his brother in Eltham. “We did save a bit. We just kind of re-prioritised going out so we saved that for special occasions – for friends’ or families’ birthdays – instead of going out for dinner once or twice a week,” Mr McLoughlin said. Both have a career with the Department of Health and Human Services, working with people with disabilities. They made an unconditional offer on the property to buy it. “We started off by attempting to buy a place in October last year at auction. We didn’t know what we were doing and we sent my parents,” Mr McLoughlin said. The couple watched the bidding action via an app as they were away when the auction was on. Mr McLoughlin’s parents made the highest bid for the property but, as the price didn’t reach the vendors’ reserve, it was passed in. “After that we were a bit disillusioned,” he said. The couple went to other auctions and decided to use a buyers advocate to help them out. They also used a mortgage broker who was a friend to get their finance. They decided on a 30-year mortgage. As Nicholas is 45, he was asked how he planned to make the mortgage repayments after retirement age. “We told them Nic would work longer than retirement age,” Ms McLoughlin said with a laugh. The McLoughlins wanted the type of mortgage where they could still enjoy a good lifestyle. “We still wanted to be able to save for holidays and have a good quality of life and not be overstretched,” Ms McLoughlin said. They have so far only made one mortgage payment since moving into their home a month ago. Jess Carmichael and her partner James Mulligan had been living together in London for four years but buying a house back home in Brisbane was always part of the plan. The couple, both town planners, did not have a specific goal in mind for their savings but had been putting money away for two years before they moved back to Brisbane in September last year. For the next six months, they lived with her parents and made the most of the opportunity, saving like mad while researching in earnest. “It certainly helped a lot. We paid a little bit of board but it was a nominal amount, certainly not equivalent to renting,” Ms Carmichael said. Settling on the character suburbs around Brisbane’s inner to middle-ring north, they had a list of features that were important to them, such as accessibility to public transport, proximity to parks and having an outlook. “We looked from September to January, seven different houses every Saturday. It was exhausting but you need to do the research,” Ms Carmichael said. The couple enlisted a mortgage broker to help them navigate the home loan process and were conscious of not stretching themselves. They had a 20 per cent deposit, which Ms Carmichael said opened up better interest rate deals for them from banks. After missing out on a house at Stafford, they snagged a gorgeous two-bedroom character home in a sought-after Kedron street via private treaty for $635,000. “The only thing this house doesn’t have that the other one did was an outlook. We don’t have a view here. But we’re seven kilometres from the city and in a really nice spot, so we’ve done pretty well,” Ms Carmichael said. Adjusting to mortgage life has been easy for the couple. “We’ve actually worked out that our mortgage repayments are less than our rent was in London,” Ms Carmichael said.